Aiding substances: Lactose, starch, microcrystalline cellulose, calcium or magnesium stearate. Salbutamol represents beta-adrenomimetic primary influence on β2 adrenoreceptors (being localized in bronchi, myometrium and blood vessels). 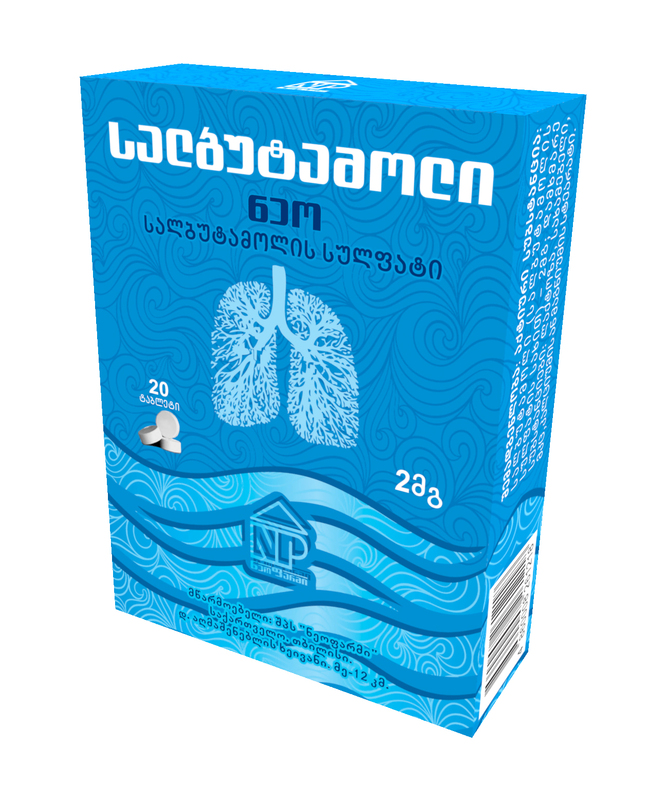 "Salbutamol Neo", with selective stimulation of bronchial β2 adrenoreceptors, causes relaxation of smooth muscles and expansion of bronchi, stops bronchospasm, increases the vital capacity of lungs. Renders weakly expressed positive chrono- and inotropic operation on a myocardium. Expands coronary vessels, practically doesn't reduce arterial pressure. Lowers, myometrium tone and contractility (tocolytic operation). Salbutamol is quickly absorbed from the gastrointestinal tract. Maximum concentration in blood serum is reached approximately in 2 hours. The preparation metabolizes in the liver and is excreted in the form of metabolites. Salbutamol sulfate doesn't break up by lungs catechol-0-methyltransferase, by this reason it has long-term action. Contraindications: Hypersensitivity towards components of the preparation, myocardic infarct. Oral intake 2-4 mg 3-4 times a day. For adults and children up to 12 years: single dose of Salbutamol is 2-4mg, next dose should be taken after 6 hours. In case of improper effect, after doctor’s consultation, it is possible to increase dosage up to 8mg. maximal daily dose makes up 32mg. For children from 2 to 6 years: for one intake is prescribed 0,1mg/kg dose, (not more than 1-2mg three times a day), next dose should be taken after 6 hours. In case of weakly expressed effect, it is possible to increase dosage up to 0,2mg/kg. It is forbidden to intake more than 4mg dose 3 times a day (maximal daily dose makes up 12mg.). For children from 6 to 12 years: initial dose makes up 2mg 3-4 times a day. In case of improper effect, dosage may be increased gradually (after doctor’s consultation); maximal daily dose shouldn’t exceed to 6mg 4 times a day (24mg). In case of overdose you should be carefully (in case of revealing unwanted side effects, you shoul stop preparation intake and address to a doctor ). For elderly age, patients’ treatment should be started from 2mg maximum 4 times a day. From the side of central nervous system: trembling (hand fingers), tension, nervousness, increased excitability, dizziness, headache, sleep disorder. From the side of cardiovascular system: tachycardia, arrhythmia, blood vessel peripheral expansion, myocardial ischemia, heart insufficiency, cardiopathy. From the side of gastrointestinal tract: nausea, vomitting, mouth dryness, loss of appetite. Rarely may develop bronchospasm (paradoxic or caused hypersensitivity towards Salbutamol), pharyngitis, urination difficulty, sweating, increase of glucose, free fatty acids content in blood, development of physical and psychical drug dependence. Usage of preparation at time of pregnancy and lactation period is recommended only when possible benefit for mother exceeds potential risk for the fetus. Salbutamol can inhibite uterus contractility function, so usage of preparation at time of delivery is permitted only in case of absolute necessity. In case of nessessity of “Salbutamol Neo” at lactation period, breast feeding should be stopped. Bescause of sympathetic system’s strong excitability, Salbutamol should be carefully prescribed patints with cardiovascular system diseases: heart ischemic disease, heart insufficiency, heart rhythm disorder, hypertension. Also, Salbutamol should be carefully prescribed patints with hyperthyroidism, epilepsy, diabetes mellitus, and glaucoma. Increase of Salbutamol dosage and siquence without doctor’s consultation is forbidden, in order to avoid overdose and undesirable side effects caused by hyperdosage. Preparation doesn’t influence on vehicle and mechanisms management. Simultaneous usage of the preparation together with other adrenomimetic means is forbidden, because it may cause undesirable effect from the side of cardiovascular system, e.g. tachycardia and strong heartbeat. In special cases, after doctor’s consultation, usage of inhalation beta-adrenomimetic means is permitted. Antidepressant means and MAO inhibitors can reinforce Salbutamol’s influence on the cardiovascular system. Primary packing: 20 tablets in polyvinylchloride blister. Secondary packing: 1 blister is located in a cardboard box. Storage conditions: Store at 15-25ºC temperature, in a dark, dry place and keep away from children. Issue: II group of a pharmaceutical product - issued with doctor’s prescription.